This page is about the disease in general. 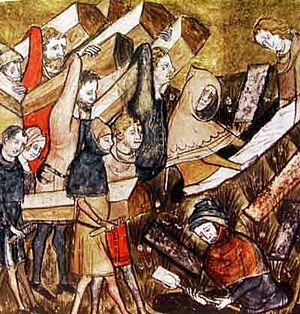 For information about the medieval European plague, see Black Death. Bubonic plague is one of three types of bacterial infection caused by Yersinia pestis. One to seven days after exposure to the bacteria, flu like symptoms develop. These include fever, headaches, and vomiting. Swollen and painful lymph nodes occur in the area closest to where the bacteria entered the skin. Occasionally the swollen lymph nodes may break open. The three types of plague are the result of the route of infection: bubonic plague, septicemic plague, and pneumonic plague. Diagnosis is made by finding the bacteria in the blood, sputum, or fluid from lymph nodes. Prevention is through public health measures such as not handling dead animals in areas where plague is common. The disease is most common in Africa. The plague is believed to be the cause of the Black Death that swept through Asia, Europe, and Africa in the 14th century and killed an estimated 50 million people. This was about 25% to 60% of the European population. Bubonic plague Facts for Kids. Kiddle Encyclopedia.